Water That is 99.9% Pure. Available 100% of the Time. With a multistage purification process, the Pure Water Ultima Classic systems filter out particulate matter, boil the water to kill bacteria and viruses, and leave behind virtually all of the remaining contaminants in the water. The result: drinking water that is 99.9% pure. The benefits of the Pure Water Ultima Classic systems go beyond customers and employees. Equipment and machinery that use water – steamers, ultrasonic cleaners and humidifiers all run better, with less downtime and lower maintenance costs, when you use high purity water. * Some configurations will need higher rated outlets and electrical connections than are standard in a home. Please seek advise from a local electrician. Save time and space by no longer needing to store or manage bottles. If you desire the ultimate in convenience and purity, the Ultima Classic is perfect for you! The Ultima Classic dispenses distilled water in hot, cold or room temperature, with the push of a button. Pure Water equipment is on the job in more than 130 countries around the world – from U.S. embassies to government agencies, from multinational corporations to professional office complexes. For over 45 years, Pure Water has been designing, manufacturing and marketing high performance purification systems. In fact, Pure Water was the first company in the world to develop small stainless steel distillation systems for drinking water. When you put a Pure Water Ultima Classic to work in your facility, you can have confidence that you have installed the best purification technology available. Using Nature’s Process to Provide More Pure Water. Every day, nature makes fresh water from the salty ocean. 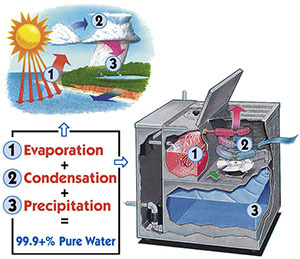 Through the invisible process of evaporation and precipitation, nature removes particulate matter from the source water and produces fresh, pure water – day in and day out. The Pure Water Ultima Classic water purification systems take nature’s natural purification process and puts it right in your place of business – producing high purity water when you want it, where you want it. A glass storage container holds one gallon of distilled drinking water and is dispensed through the pour-through lid.